← Peach Valley—GPS Proves its Worth!! I was bound and determined to find the real Candy Cane Loop, a double-track loop just north of the Peach Valley parking area. Unfortunately, it's not well signed. I went back to Peach Valley on Saturday, April 16, 2011 and enjoyed the stunning weather. I was determined, among other things, to travel the Candy Cane Loop. I’d tried last year and got lost. Well, I got lost again, but this time I’ve got the GPS mounted where I can see it, so I kept trying things until I found the loop. Unfortunately only some of the route signs are there. I got quite confused on the west end, exploring essentially every reasonable path. 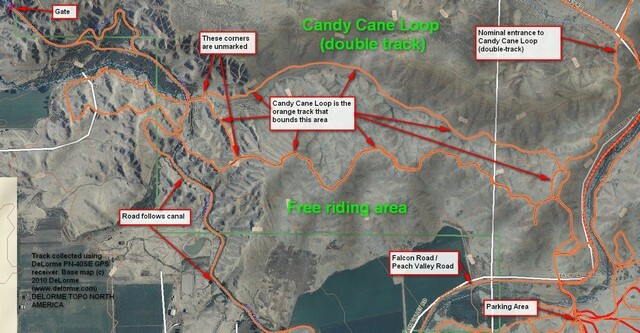 It wasn’t until I got home that I compared this with “Tommy’s Super Secret Ride Map for the Adobes” and picked out what must’ve been intended as the Candy Cane Loop. The loop is intended for ATVs, but motorcycles can do it easily. The northerly part is relatively flat, but the southern part follows ridges and there are some ups and downs that you really want to have some momentum for. I rather enjoyed it and was pleased I’d finally found the real Candy Cane Loop! This entry was posted in GPS Tracks, Montrose County, Motorcycling and tagged Candy Cane Loop, Colorado, dirt bikes, montrose county, motorcycling, Peach Valley. Bookmark the permalink.